I made a backup of my iPad Pro using iTunes. Can I restore that backup onto another iPad? I made a backup of my iPad Pro using iTunes. The backup is on my PC not on iCloud. The iPad broke a few days later, so I went to a store to make the AppleCare valid, we formatted it on the store. Will I be able to restore my old backup into the new iPad? 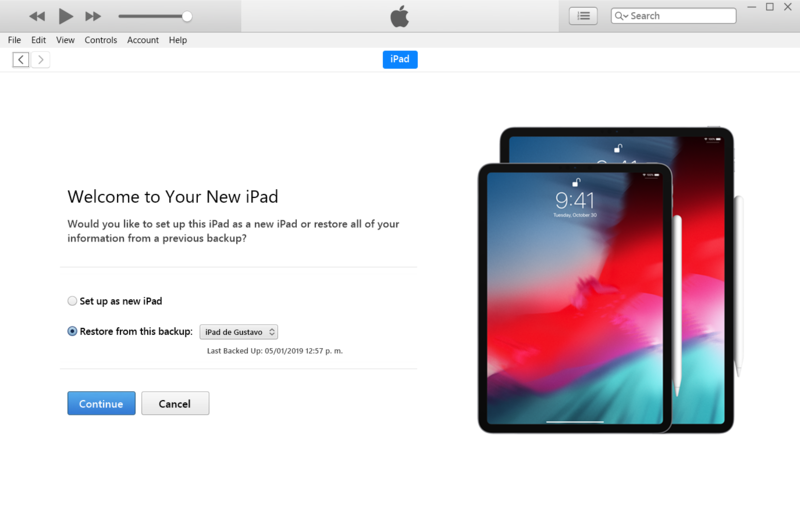 Yes you can restore the backup to your new iPad. I've restored my iPad backups many times when I went from model to model, starting from the iPad1 all the way to the iPad 6th gen. Note: I don't use Windows iTunes, but I think the function is the same. Not the answer you're looking for? Browse other questions tagged ipad backup restore . Can I transfer videos from iTunes to an iPad not associated with it? Why does restoring iPad not restore e-mail? Best way to fix? Is it normal to be signed out of all services and accounts when moving iOS devices?